Arthritis in dogs is a chronic condition but that doesn't mean it can't be managed and your dog's mobility improved to a certain degree. In this guide, part of our Canine Arthritis Awareness Month series which has teamed up with A Walk In The Park.co.uk, we'll take a comprehensive look at arthritis in dogs (canine osteoarthritis) and examine some of the treatment for arthritis in dogs as well as diet plans for dogs suffering mobility problems. Pain relief for arthritis in dogs can be provided through a number of non surgical interventions and the aim of any treatment will be to improve the quality of life of the dog and ease their mobility problems. It is, therefore, important to review and assess the condition at regular intervals. If the condition is not severe, then the treatment can be restricted to providing relief from pain, inflammation, and wear-out of the joint. In many cases, the long-term treatment is only pain alleviation. However, in situations where medications are not effective, surgery will have to be resorted to. Typically, there are two types of surgery. One option is to reshape the joint to reduce pain and ease movement, while the other option is to replace the joint. Another method of treating dog arthritis is by way of nutritional supplementation. A glucosamine-based dietary supplement may provide ingredients required for repairing joints. In fact, it may aid in the rehabilitation of the cartilage and joint structure. It takes about 3 to 4 weeks for the effects to be seen. As regards the serving size of glucosamine, it is recommended that a veterinary doctor specialized in providing supplementation solutions be contacted. Glucosamine supplementation in liquid form has been found to be more effective and there are no serious side effects as in the case of NSAIDs. Some dogs may develop minor diarrhea, but it can be taken care of by giving it along with a meal, reducing the serving size, etc. Many other treatment plans that do not use dog arthritis medication can also be tried if found useful in specific cases. These include exercise, weight reduction, acupuncture, massage, hydrotherapy, etc. Generally, a combination treatment plan that includes high quality glucosamine supplementation, a regular exercise routine, maintaining optimum body weight and occasional use of NSAID and anti-inflammatory medication may provide the best solution for dog arthritis relief. Can Certain Dog Beds Help Arthritic Dogs? Arthritis is a very common affliction in dogs and is largely a result of lack of exercise and excess weight that causes stress on the joints. Medication and pain control can help to alleviate the misery of dogs who you will rarely find complaining as you will in human sufferers of the same disease. It therefore makes it necessary for the pet owner to find ways to reduce the discomfort of the dog by seeing that it is able to easily access places it is used to going to with the introduction of stairs or ramps that can help to reduce the stress on joints that can come from jumping to get to that place. The arthritis condition of jobs is made all the more severe when it sleeps on hard floors like most dogs prefer to do. Arthritis is a degenerative disease of the joints and this can become worse if the dog continues to sleep on floors that are hard and cold. So can certain dog beds help your arthritic dog? A variety of dog beds are available in pet stores that can make a comfortable bed for the dog to sleep in and avoid the cold and hard floors that will aggravate the arthritic condition. When you are looking for a dog bed that can help your arthritic dog one must make sure that it has the right supportive materials and can also ensure the dog the necessary warmth that can bring relief to the arthritis. Dog beds with memory foam are among the best materials for a therapeutic dog bed. This ensures that the pet is always able to sleep in the positions that it finds most comfortable as the foam will remember the contours and shape. Memory material as found in memory foam dog beds is one that has insulating properties and also responds to variations in temperature. The heat from the dog's body will cause the foam to realign itself so that the pressure points like the spine, legs, shoulders and hips are properly supported. This provides a lot of relief to a dog suffering from arthritis. It is also possible to get such memory foam inserts that you can place on an existing bed which the dog is already familiar with and does use. There are beds meant for dogs that can be heated up and give a lot of relief to joints and muscles. The heat also allows the blood vessels to expand and this increases circulation to affected areas. Heat can also restore the flexibility of joints and relax muscles that are tense. During the summer months however it may be needed to provide dog beds that can be cooled. Most such beds have electrical systems that run on low power and has air being constantly blown through the bed. Certain dog beds are available that can allow inserts to be changed in the beds so that you can make the necessary changes depending on the weather. Dog beds that are oval or round are the ones that most dogs prefer as this enables to sleep with the body curled. Beds may vary in size and the size you choose is the one that your pet will find it comfortable to sleep in. As our dogs get older, their nutritional requirements change. Their joints have taken the strain of many years, running, jumping in, out of and over things and we have to find the right food that’s best for their joints. Fortunately, that’s now easier than ever thanks to the wide range of dog foods that have been developed with canine jointcare in mind. What changes do you need to make to your dog feeding regime as your dog gets older? The changes you make to your dog feeding regime, and when you make them will vary depending on the age of your dog, and the breed of your dog. It is considered that the larger and giant breeds of dog age earlier than the smaller and toy breeds of dog. Your objective in managing the nutrition of the older dog is to enhance his quality of life, delay further ageing changes, and to extend his life whilst maintaining his optimal weight. You are also trying to slow down the onset of disease and improve immune function. Older dogs will generally be less active than younger dogs so as a rule will require a less energy dense dog food, unless of course the dog’s appetite is reduced for some reason. Continuing to feed a dog the same amount of food with less exercise will inevitably result in obesity, a problem all too common in many dogs today. In the old dog obesity can be a bigger problem than in the young dog as there may also be concurrent arthritis and organ problems which will be made worse. A keen eye is needed to assess the energy needs of your dog as it ages, so be aware and switch brands if your dog’s weight shows marked changes as it ages. In summary, arthritis in dogs doesn't mean an end to your dog's quality of life. 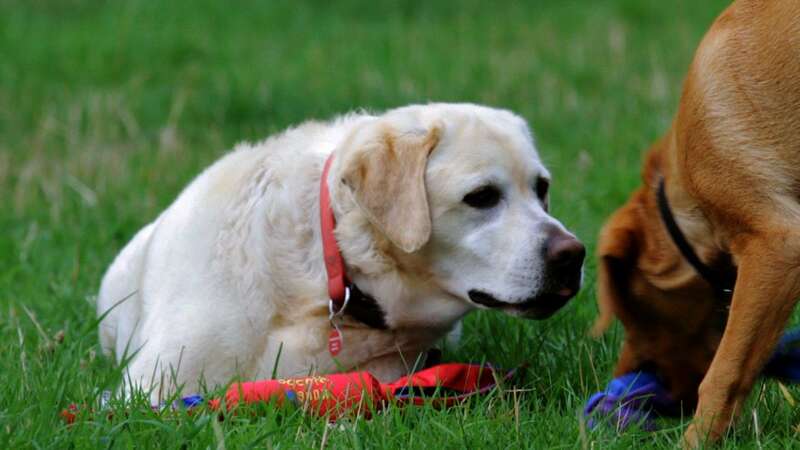 Yes, their mobility is very likely to be impaired and you will have to take certain management approaches in order to ensure your dog is prescribed the most appropriate treatment plan but the good news is there ARE things you can do as the owner of an arthritic dog to keep their tail wagging and joints moving. Diet, medication, appropriate exercise are just three of the most effective areas to focus on for arthritis in dogs. Many thanks. Great, helpful article and video clips. Will be trying the exercise ideas to help alleviate stiffness in my dog. I think my dog is in the early stages of arthritis, off to the vets next week. In the mean time going to start implementing some of your ideas. This overview of how canine arthritis can be managed and treated is very helpful. When my Labrador was diagnosed with arthritic hips, I opted for non-surgical treatments. Currently, her treatment includes anti-inflammatories, pain medication, and gentle massage of the affected area. It’s helped her quality of life, but there’s still room for improvement. I’m considering adding acupuncture to the treatment “mix” because I’ve heard some owners say it helps alleviate the pain and restore some of the lost mobility. Still, it was interesting to learn about the surgical options and I’m intrigued about the possibilities offered by hydrotherapy and therapeutic beds, both the heated and memory foam type. The videos were also very interesting. I think it’s also worth mentioning the role of adaptations in the management of arthritis, which can make a big difference. We managed our elderly Yorkie with exercise and Metacam but also built ramps and steps around the house/garden. We hadn’t realised that she had a problem until she had difficulty eating and we later found that she was experiencing pain when bending her neck. Elevating her bowl on a block made a huge difference! I take issue with lack of exercise and overweight comment, i have two german shepherds 1 is over 12 the other will be 10 in june,my eldest started to creak at 10 my vets words ,the other is fine at the moment,both of these dogs have been walked for miles every day of their lives until the elder 1 started to slow down,he has been treated with all the usual drugs until they affected his stomach,i am fortunate that my vet had a vet who is qualified in acupuncture for animals,my dog has responded very well he has a very good quality of life and is happy,it is worth giving it a try or see if you dog is suitable for this , not every dog responds but it worked for mine without it he would not be here.